Gigantically comprehensive and carefully researched, Security Engineering makes it clear just how difficult it is to protect information systems from corruption, eavesdropping, unauthorized use, and general malice. Better, Ross Anderson offers a lot of thoughts on how information can be made more secure (though probably not absolutely secure, at least not forever) with the help of both technologies and management strategies. His work makes fascinating reading and will no doubt inspire considerable doubt - fear is probably a better choice of words - in anyone with information to gather, protect, or make decisions about. Security engineering is about building systems to remain dependable in the face of malice, error or mischance. It requires cross-disciplinary expertise, ranging from cryptography and computer security to a knowledge of applied psychology, management and the law. Although there are good books on many of these disciplines, this book is the first to bring them together into a comprehensive guide to building complete systems. 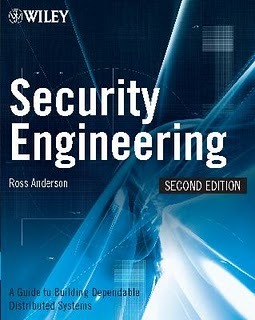 Written for the working programmer or engineer who needs to learn the subject quickly but has no time to do a PhD in it, the book brings the subject to life with detailed descriptions of automatic teller machines, burglar alarms, copyright protection mechanisms, de-identified medical record databases, electronic warfare systems, and other critical applications. It also covers a lot of technology for which there isn't any good introductory text, such as biometrics, tamper-resistant electronics and the tricks used in phone fraud.